Jeremy Corbyn slammed Theresa May’s last-minute attempts to save her Brexit deal today after the Prime Minister urged MPs to give it “a second look”. The Labour leader said the joint letter to May from the EU’s Donald Tusk and Jean-Claude Juncker, which aimed to offer assurances on the controversial Irish backstop, “means nothing”. 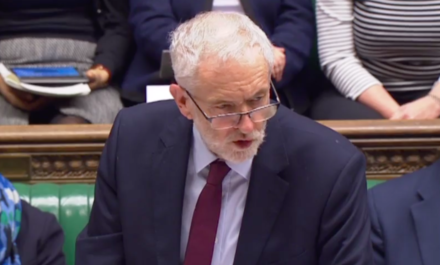 In his response to the latest Brexit statement from the Prime Minister, Corbyn argued that May had “completely and utterly failed” to gain assurances from the EU that were legally binding, as she had pledged to do when delaying the meaningful vote in December. He concluded that MPs would “not be fooled” by the European council and commission presidents’ letter, and said he hoped the deal would be voted down tomorrow. Corbyn again made the case for a Brexit deal including customs union membership, a strong single market relationship and guarantees on EU rights and standards, and for holding a general election. Below is the full text of Jeremy Corbyn’s response to the Prime Minister’s statement on the Brexit deal in the House today. Mr Speaker, I would link to thank the Prime Minister for advance copy of her statement. In December, the government shamefully pulled the meaningful vote on her deal with the promise that the Prime Minister would secure legal assurances from the EU that the backstop would be temporary. The Leader of the House confirmed this saying: “The Prime Minister is determined to get the legal reassurances that Members want to see”. While the Foreign Secretary told us the Prime Minister would ‘find a way’ to win tomorrow’s Commons vote by getting assurances with ‘legal force’ that the Irish border backstop is only temporary. On receiving this letter today to the Prime Minister from the President of the EU Commission and Council, it must now be clear to all Members across this House yet again the Prime Minister has completely and utterly failed! Today’s letter is nothing more than a repetition of exactly the same position that was pulled more than a month ago. It categorically does not give the legal assurances this House was promised and contains nothing but warm words and aspirations. Mr Speaker, isn’t it the case that absolutely nothing has changed from the Attorney General’s letter of advice to the Cabinet? His advice which the government tried to hide explained with great clarity the reasons why the UK could find itself locked in to the Northern Ireland “backstop” Protocol with no legal escape route. He has himself updated his legal advice today and he clearly says, and I quote, “they do not alter the fundamental meanings”, as he advised them in November. If there were legally binding assurances on the temporary nature of the backstop, then surely they would be written into the withdrawal agreement itself? The letter published this morning is clear this is not possible, saying: “We are not in a position to agree to anything that changes or is inconsistent with the Withdrawal Agreement”. Mr Speaker, this morning’s joint letter does say “negotiations can start as soon as possible after the withdrawal of the UK”. But my question to the Prime Minister is how is that possible when the Cabinet cannot agree among themselves? That is why the Political Declaration is so vague. Actually, Mr Speaker, I believe the right word is “nebulous”. Given the Prime Minister has failed to secure the promised changes, there can be no question of once again ducking accountability and avoiding tomorrow’s vote. No more playing for time; no more running down the clock to scare people into backing this damaging shambles of a deal. I am sure Honourable members across the House will not be fooled by what has been produced today. It is clear what we are voting on this week is exactly the same deal we should have voted on in December. I am sure the Prime Minister knows this – that is why today she is trying to blame others for this chaos. Given the lack of support for the Prime Minister’s deal, you might have thought she would try to reach out to MPs. Instead the Prime Minister is claiming that by failing to support her botched deal, Honourable members are threatening to undermine the faith of the British people in our democracy. Mr Speaker, the only people who are undermining faith in our democracy is the government itself! Mr Speaker, I can think of no greater example of democracy in action than for this House to reject a deal that is clearly a bad for Britain. During the past two years of these shambolic negotiations, the Prime Minister has failed to listen. She hasn’t once tried to work with Parliament to construct a Brexit deal this House and the country can support. And now she is left facing a humiliating defeat. She is blaming everybody else but herself. Mr Speaker, if this deal is rejected tomorrow, and I hope it is, the blame will lie firmly with this government and firmly at the feet of the Prime Minister. There is a deal that could command the support of this House: a deal which includes a new and comprehensive customs union; a strong single market relationship; and a guarantee to keep pace with EU rights and standards. Instead the Prime Minister still chooses to take the most reckless path. Mr Speaker, as we enter the week of the ‘meaningful vote’, let us remember the incompetence we have been forced to endure. We have seen two years of shambolic negotiations. Red lines announced and then cast aside. We are now on the third Brexit Secretary, all of whom have been largely excluded from vital stages of the negotiations. We were promised the easiest trade deal in history, yet have seen a divided government deliver a botched withdrawal deal with nothing more than a vague outline for what our future relationship with the EU will be. Meanwhile, conditions in this country for millions of people continue to get worse. The government is in disarray. It is clear if the Prime Minister’s deal is rejected tomorrow – it is time for a general election – it is time for a new government.